Hi. Sleepy Ach here. I woke up at 5AM for no good reason, so I decided to write about two awesome group gifts. The first is Canimal's brand new subscribe-o-matic gift, a cute little dress called the Naughty Nautical. 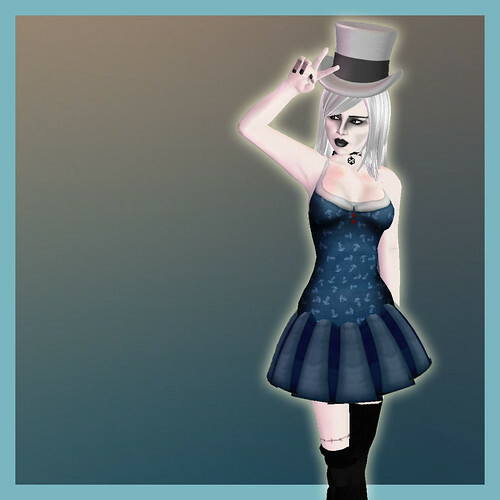 I'm wearing it with a free top hat that I found on onrez from Curio Obscura. I'm a huge fan of that shop, and the top hats are nicely made! They come in a box of five. The second outfit is from MichaMi's update group, her December gift. It consists of two lovely corset-outfits, the Carmela Bustier in green and red. So cute and carefully constructed! Those bustiers from MichaMi are breathtaking. Thanks for posting about them! Ah! hats, my biggest sl downfall! !